This unique and beautiful store seemed to appear out of nowhere, with little fanfare and little hype. Yet this place is one of the hidden treasures of Downtown Disney in Anaheim. As you can guess by the name, it’s an art gallery. But to say it’s an “art gallery” is like saying Disneyland is a “theme park.” It IS, but it’s also so much more. Wonderground Gallery showcases the art of Disney and Disney characters in fun and unique ways. From classic presentations of Disney characters to modern (and sometimes surreal) interpretations, it has something for everyone. What makes this gallery unique is what they offer on top of what you would find in a traditional gallery – what Walt would call “plussing” it. When you walk in it’s more than just “paintings on walls.” It’s more than figurines with little placards. It’s a well-designed layout of artwork that dazzles your eye. You find yourself wandering around the store, finding treasures on shelves, on walls, on centerpieces. It’s almost like a treasure hunt – you can’t help but wander through the entire place, wondering what you’ll find next. And what also makes it different than a traditional art gallery? All of it is for sale. As you would expect from high quality art, it has a pretty high price tag. But luckily, they have various versions of the artwork so you can find something that fits in your price range from originals to giclees to prints, each priced accordingly. I love the fact that they even have postcards of some of my favorite pieces on display. For less than $5, you can own a reproduction of some of the best pieces and you can create your own mini galleries at home. I was shocked (and very pleasantly surprised) to find one of my favorite comic book artists featured here – J. Scott Campbell. Known for his stellar depictions of both classic characters and his own creations, Mr. Campbell is a well-known and highly sought after illustrator in the graphic novel arena, and to see his work on display here at Wonderground Gallery was a treat. He even made an illustration of one of my favorites – The Incredibles! On top of being able to buy original art and reproductions, they also have a variety of artistic fun gadgets and crafts. From paper sculpting kits to erasers that look like cars and have pull-back motors, it is a variety of FUN! 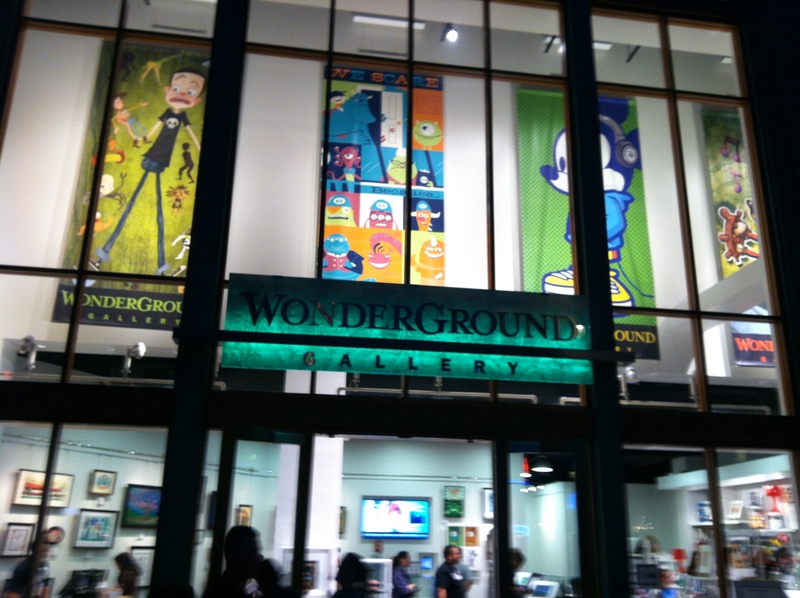 So if you’re strolling through Downtown Disney outside of Disneyland and want to peruse something new and interesting, stop by the Wonderground Gallery. You’ll be glad you did. Awesome article! 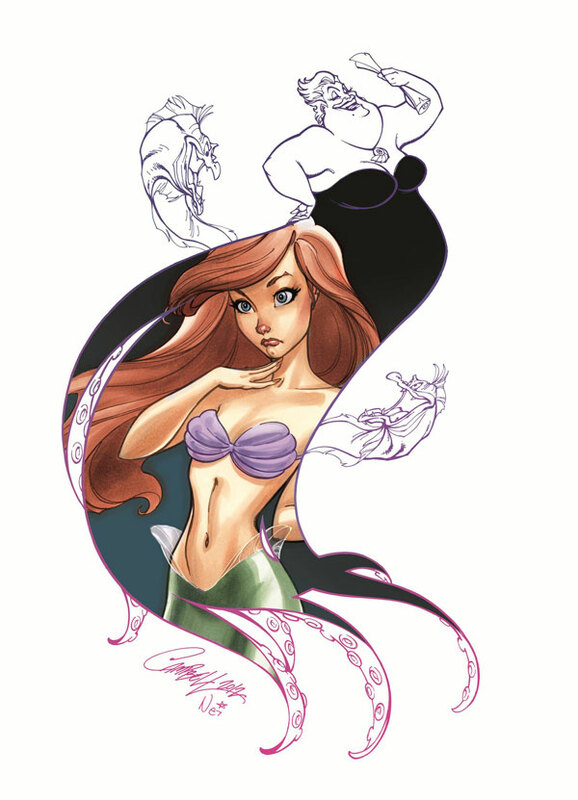 LOVE the Ariel/Ursula art! Would love to visit there someday!